1.4 4. 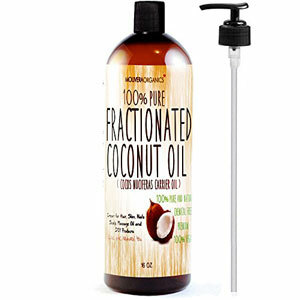 Molivera Organics Fractionated Coconut Oil 16 oz. 2.2 What Properties Should You Look for in Massage Oils? 3 What Is the Purpose of a Massage Oil? 4.1 Which Oil Is Better for Body Massage? 5 Massage Oil vs. Lotion – Which One Is Better? There are numerous types of massage oils and each one of them is used depending on the special needs. From scented and unscented oils to medicated, un-medicated, solids, liquids and even creams, massage oils were created to provide you with the comfort you need during a session. Did you know that each type of oil has a different effect on your skin? Whereas some of them make your skin feel greasy, others can quickly go rancid, and even end up smelling bad. That being said, if you know the differences between oils, it’s much easier to choose one that suits your needs. This article contains massage oil reviews in order to help you choose the best massage oil to use in any situation. So, without further ado, let’s see some of the best massage oils that can come to your aid. Having sore muscles and tendons is a burden, and when you deal with this problem for too long, finding a solution becomes your main focus. Thankfully, this herbal oil is meant for such issues, being able to soothe sore muscles and tendons, thus making you feel better overall. This oil was created based on a classic recipe that was used for many years in Ayurveda. What’s nice about this oil is that it can be applied directly to areas where physical discomfort is felt, thus relieving it as a result. The oil works by warming and nourishing the tissues, thus supporting an active lifestyle. Moreover, it can be diluted with a base oil, and then used in deep-tissue massage. All in all, it’s really good to use when you feel muscle and tendon pain because it will relieve it and help you live your best life once again. Are you looking for a massage oil that is 100% pure and organic? If that’s the case, this product is the one for you. 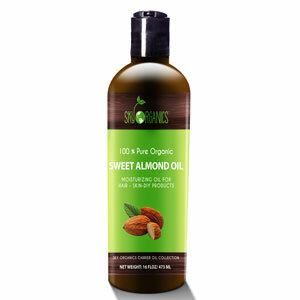 This Sky Organics sweet almond oil comes directly from organic artisanal farmers, making it just right for those looking for organic alternatives. One of its greatest advantages is the fact that it’s safe to use even on sensitive skin, and it doesn’t pose any danger even for babies. That being said, it contains many proteins and vitamins, as well as essential fatty acids, antioxidants and even more. Besides, it doesn’t feature any additives or harmful chemicals. It works best for hydrating, nourishing and healing the skin, and can even be combined with other essential oils. In addition to these, it also makes the skin and hair look good and healthy. So, if you’re looking for something that has all these benefits while having a pleasant aroma, then you shouldn’t refrain from purchasing this product. Have you ever heard about the many benefits of jojoba oil? Not only is it healthy for the scalp and hair, but it also works by restoring the elasticity of the skin and softening it. If you want to get a massage once you’re done with the shower, this oil is best to use at that time, while your skin is still wet. Moreover, this oil is amazing for soothing and treating sun and wind-burnt skin. It can be mixed with essential oils depending on your taste, thus increasing its strength. Jojoba oil is so great because the skin easily absorbs it and it’s non-greasy. It can also work as an amazing moisturizer, so if you have dehydrated skin, it’s a good alternative. Also, you don’t have to pour the whole bottle of oil – just a little amount can be spread to a wider area, so the product will last you for a long time. 4. Molivera Organics Fractionated Coconut Oil 16 oz. If you like oils that are 100% pure, this Molivera oil might be down your alley. It’s great for personal and professional massage, and it also works for moisturizing your hair and skin, and for aromatherapy. Moreover, if wrinkles are making your life harder and decreasing your self-esteem, you’ll be happy to know that this oil is beneficial to increase the skin’s elasticity. That being said, it significantly moisturizes the skin and makes it look youthful and glowing. The oil has no odor, but it surely has a lot of benefits, as it penetrates deeply into the skin, healing, and conditioning it. So, if you’re up for a relaxing massage that has a good impact on your skin, you could give this oil a try. Coming directly from southern Oregon farms, this oil is made from the whole flower of certified organic Calendula officinalis plants. Therefore, as a natural product, it’s great to have for those who value healthy things. It’s gluten-free, vegan and non-GMO. The flowers are hand-harvested while in full bloom in order to assure the optimal extraction of the bioactive compounds. In addition, their color and aroma are retained by being carefully shade-dried. Afterward, the flowers are thoroughly extracted and concentrated into cold-pressed, certified organic olive oil. 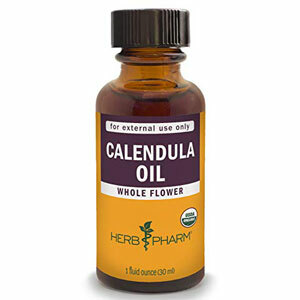 So, it’s important to remember this aspect and not assume that it’s 100% pure Calendula essential oil. This oil does wonders for those with varicose veins, cracked lips, scrapes, acne, cuts, burns, dry skin and many others. It’s a wonderful natural remedy for those in need, and it comes at a good price as well, making it a good investment, so your money won’t be thrown out the window. Do you struggle with dry skin? If the answer is positive, then you’re surely looking for something that can moisturize it and give it the elasticity it lacks. This oil will help you get rid of dry skin, and it’s also good for stress relief. After all, who doesn’t like to get a well-deserved massage after a long stressful day/week? Additionally, if you have wrinkles, this oil will help reduce them and will leave your skin soft. Also, if you’re worried about animal cruelty, you’ll be happy to know this product is cruelty-free. If you want to finally feel relaxed while enjoying a healthy and moisturized skin, this oil is the right product for you. It can also relieve aches and pains, and it enhances sensual experiences as well. All in all, this tropical flavored massage oil would be a great investment for anyone looking for some relaxing “me” time. Let’s face it: although stretch marks are something hard to avoid and something human, they are annoying to deal with and difficult to hide. Like that wasn’t enough, they decrease your self-esteem, and make it hard for you to wear the clothes you like because you fear what those around you will think. This oil made of natural ingredients is packed with vitamins and it’s infused with specific essential oils, which work against stretch marks. The oil helps detoxify the lymphatic system and fights against fat deposits too. Besides, it helps moisturize your skin and prevent dryness. Also, it makes stretch marks less visible and, as a result, can boost your self-esteem. The oil works by penetrating the skin and making its way to the fat tissues. Thus, it’s great for hips, thighs, buttocks and more. 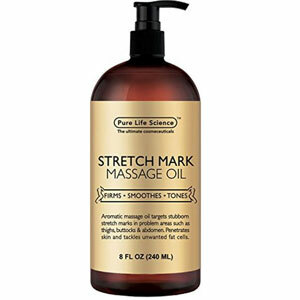 So, if stretch marks are giving you headaches, you’ll surely love this product. As a rule of thumb, before you purchase anything, you need to know what to look for in the said product, so you end up choosing one that fits your needs. Each product has unique features that make it what it is, adding to its worth or not, depending on the situation. Having said that, when it comes to massage oil, the rule still applies – you need to know what to look for if you want something good. So, this buying guide will tell you what you should take into consideration. It’s not a surprise that some products are more expensive than others, leaving you to wonder if the extra pennies are worth it or not. Although you’re usually inclined to believe that a higher price is a sure way to get top-notch products, it’s not always the case. If you choose something based on a higher price, you might end up noticing that the product is not that special after all. Just by looking at the list of oils mentioned above, you’ll be able to see that there are massage oils that have affordable prices and still come with a number of benefits. So, the price is not the most important factor to take into consideration. Usually, salons use professional products with long-lasting effects. However, nowadays, you have the chance of finding professional oils that can be purchased for home use. The oils used at salons are so good not only because of the many properties they have, but also because they are combined with the techniques used by the therapists. Professional massage oils are meant to allow the therapists’ hands to move easily over your skin. These movements are meant to relax you while relieving any type of pain you’ve been feeling beforehand. At-home massage therapy is usually done because people enjoy the way their skin looks, smells and feels after going to a salon. As such, they want to continue the process in the privacy of their own home, taking care of their skin. At-home oils might be much cheaper compared to professional ones, but they can still come with numerous benefits. From oils that are quickly absorbed into the skin to oils that soften your wrinkles and moisturize your skin, there are plenty of products that can be very effective. No matter which one you end up choosing – a professional or non-professional massage oil – both of them can be very helpful. You just need to choose based on your preferences, and what each one has to offer compared to the other. The type of oil you choose is very important, as each type has a certain set of properties and benefits. With that being said, you should be aware of the many massage oil types that you can find on the market, so you purchase one that could be of help for you. 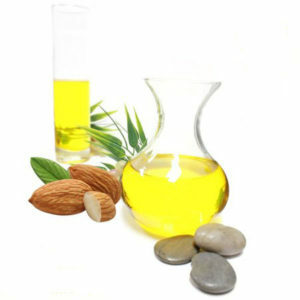 Almond oil is the one that’s usually used in aromatherapy applications, and it’s used as a massage oil too. If you’re into aromatherapy, it might be just what you’re looking for. Jojoba oil is amazing as it works for all skin types, even the more sensitive ones. Despite not being absorbed that easily, it’s an excellent moisturizer, not allowing your skin to get dry. Grapeseed oil is the one you should go for if you need something that also has regenerative properties. It’s high in linoleic acid, and it’s also a very good moisturizer. Avocado oil is mostly used by those that have very dry skin, especially elders. Considering it’s so easily absorbed into the skin and it has soothing properties, people with psoriasis or eczema will benefit a great deal from it. Avocado oil is usually blended with another type of carrier oil during massages. In addition to the types of massage oils, you need to know that mixing them with essential oils is a great way to customize your own blend, depending on your preferences and needs. Essential oils are also of many types, such as eucalyptus, lavender, peppermint, rosemary, and others. You can choose them depending on how light and heavy they are, and even based on the scent. What Properties Should You Look for in Massage Oils? Your skin might get dry from time to time and this can feel rather uncomfortable. At the same time, dry skin doesn’t look good and it can decrease your self-esteem. That being said, massage oils should always have the power to moisturize your skin, adding to its elasticity and making it look youthful. Depending on the level of dryness, you need to choose an oil that’s more or less hydrating, so check this out before getting the product. When you choose a massage oil, you need to make sure it has low viscosity. What this means is that it should easily flow on the skin without being sticky such as sugar syrup or honey. Oil should be spread without too much effort and should be absorbed easily. This may not seem as important as the other properties, but the purity and quality of a certain oil are also important. Generally, an oil that is filtered will feel much better when you touch it – in other words, it will be more refined. On the other hand, oils that have been directly obtained from the cold press may feel quite greasy. It’s definitely not a nice feeling, and it’s usually avoided in a massage oil unless necessary. Just as mentioned above, a massage oil should moisturize the skin. As such, you should look for oils that are not drying your skin. Some oils such as hemp oil may have a drying effect – they dry out much quicker compared to other oil types, and they also make the skin feel dry. Unless you need such oil for your conditions, it’s better to choose a moisturizing one. Some oils are denser than others, but you should make sure to choose one that is not very dense. It should be pure and filtered. As you’re already aware of, there are oils that are easily absorbed into the skin, thus moisturizing it. However, not all oils are absorbed at the same speed. When it comes to massage oils, you should go for a product that is absorbed with enough speed, while not too fast either. After all, the oil should stay there for the massage, after which it can get absorbed. The smell is an important thing to take into consideration when choosing a massage oil. There are numerous scents out there, so you can choose something that incites your senses. The problem is that there are nutritionally good oils that don’t have such a pleasant smell. In this case, you can simply combine them with fragrant essential oils, and the issue is solved. The massage oil you need depends on one more thing – the specific type of massage you are going to use. Having said that, a certain kind of massage will require the proper oil, and you might also develop a personal preference for it. Are you in need of a high-friction massage, such as sports massage or deep tissue massage? If that’s the case, you are going to need lighter oils, like grapeseed oil. The benefit of lighter oils is that they offer enough lubrication so the hands can easily slide on the skin and prevent irritation. Additionally, they are absorbed pretty quickly, which prevents too much slipping once you apply more pressure. 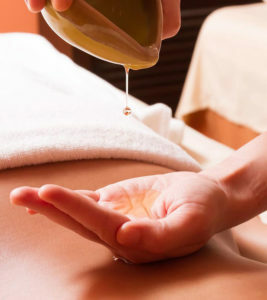 At the same time, if you need low-friction massage techniques such as Swedish massage, you will usually need a heavier oil, such as olive oil. The thing with heavier oils is that they are not absorbed as quickly as lighter oils. They also serve as a slippery barrier for a more effective massage, thus focusing on this aspect. Moreover, if you combine a carrier oil with essential oils, they can become very relaxing, healing and restoring. If you mix aromatherapy with the massage itself, it’s essential to know the best types of massage oils that can help with this. What Is the Purpose of a Massage Oil? If you’re not used to massages and similar procedures, you might wonder why you need a massage oil and not just have the massage as such on the dry skin. Although massages without oils are not unheard of, you’d be surprised to find out how helpful massage oils can be. 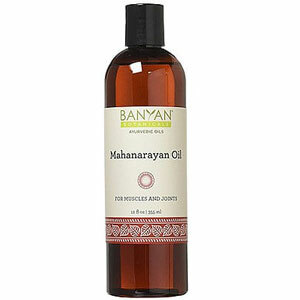 The main purpose of massage oil is to let the one doing the massage easily apply the techniques, with their hands easily slipping over the surface of your skin. Not only does this make their job easier, but it also makes the process less painful for you. Another purpose of massage oils is to nourish the skin and moisturize it, being really beneficial for those suffering from dry skin. All in all, it’s meant to help your skin be healthy, as well as boost the pain-relief process and make you feel more relaxed. There are numerous oil massage benefits, yet they may differ depending on the type of oil you use. Therefore, some oils have more benefits compared to others, so there’s no definite list of benefits that apply to each and every type. One of the biggest benefits you will find with massage oils is their ability to moisturize your skin. Dry skin is never pleasant, as it ruins your self-esteem and makes you feel bad overall. Usually, oils are absorbed by the skin – some quicker than others – and this leads to a moisturized and healthy-looking skin. Basically, oil is what helps the massage go smoothly, thus letting the one applying the techniques easily slide their hands on your skin. That being said, it makes it possible for them to massage your body in such a way that it increases the blood circulation, no matter if we’re talking of a foot massage, a shoulder massage or a scalp massage. In return, this improves your energy levels, because the cells will receive more nutrients and oxygen. Numerous people choose oil massages due to certain types of pain they are feeling in some parts of the body. And rightfully so, because oil massages have pain-relieving properties and help people relax. Basically, if you have sore muscles, for instance, you can just consider a massage with almond oil, which will easily offer relief and make you feel in power again. Which Oil Is Better for Body Massage? When it comes down to this, choosing the best oil for body massage depends solely on the reason you need a massage for, as well as the properties the oil has. For example, apricot kernel oil is amazing because of its light texture, which makes it very good as a facial oil. It also works for sensitive, dry, inflamed or mature skin. It has a lot of vitamins, including Vitamin A, as well as essential fatty acids. Jojoba oil, on the other hand, is amazing for people who are in pain but also suffer from back acne. This oil has amazing antibacterial properties, which is why it’s so good for these situations. If you don’t use oil regularly, this product is a great choice, as it has a very long shelf life. In addition, it is absorbed quite easily and can moisturize the skin. That being said, the answer to the question “which oil is better for body massage?” depends on your needs and the properties and benefits of the oils. Massage Oil vs. Lotion – Which One Is Better? 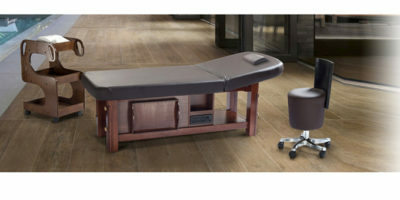 Sometimes, it’s hard to choose between these two, as they are both used for massages and have their own sets of benefits. Lotions, for example, are good as they can make the skin look much younger, and they offer hydration and softness. Also, they contain a wide set of vitamins, such as Vitamin A, Vitamin D, keratin and many others. Furthermore, the ingredients can repair damaged skin, heal skin conditions and the list can go on. However, lotions may feel quite cold when applied to the skin, which is what makes them uncomfortable. Furthermore, lotions are more likely to contain synthetic chemicals, which is why most people stay away from them. Oils, on the other hand, serve as skin moisturizers, make the whole massaging process much easier, and are good at warming up quickly. Also, most natural oils are noncomedogenic, which means that they do not risk clogging your pores. In addition, oil glides on the skin much better. Some disadvantages you will find with oils is that they may be too greasy depending on the oil type. Moreover, oil is slippery, and if it drips on the floor and you’re not paying attention, you’re at risk of accidents – it’s a low risk, but it’s there nonetheless. Overall, oils are a much better alternative for massages, as they have fewer disadvantages. How Do I Use Massage Oils? Using massage oils is not hard – all you have to do is apply them directly on the skin, after which you start massaging the body using various techniques. Massage oils aren’t dangerous, but if you have certain skin conditions, some types of oil may do a lot of harm. For this reason, it’s better to ask the person performing the massage what kinds of oils he/she is using and see if they come with any side effects. Similarly, if you want to buy one or more types of oil for personal use, do some research beforehand and see if they are safe for your condition/skin or not. What Precautions Should I Take When Using Massage Oils? Although massage oils have so many benefits, there are some precautions to take before you use them. For example, you should do a skin test before using them, so you ensure you’re not allergic. If the skin becomes irritated, stop using the oil. You should also avoid any eye contact because they can be quite irritating. To check out in-depth reviews of all the best back massagers head over to our buying guide. Choosing the best massage oil to suit your needs may not be the easiest task, especially if you’re unaware of the many different types of oils and the properties they have. It’s easy to choose the wrong product, but you don’t want to spend your money carelessly. That being said, this guide was written precisely to show you what to look for in proper massage oil. The massage oil reviews presented above have helped you find an oil that will not only be beneficial but will also last you for a while. In addition, you are now aware of the properties of different massage oils, as well as the benefits they have and why oils are so important during a massage session. Therefore, we hope that this guide was of help to you and that now you can go and browse the market for an oil that suits your needs.